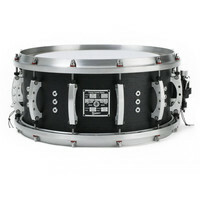 The Premiere Beast Snare drum delivers unrivaled power and sensitivity. The air-flow shell technology with sonic chambers that circulate the air movement through the shell is designed to bring body and depth to its tonal characteristics. The snare features a 50-ply (28mm) specially blended shell formulated and hand-made in England from Birch Tulip Sycamore Oak and Maple. The Premiere Air-Flow system is a break-through shell technology that transports power and projection via air vents that control the volume of air released from the shell. The end result is a dynamic dominant and versatile snare drum.